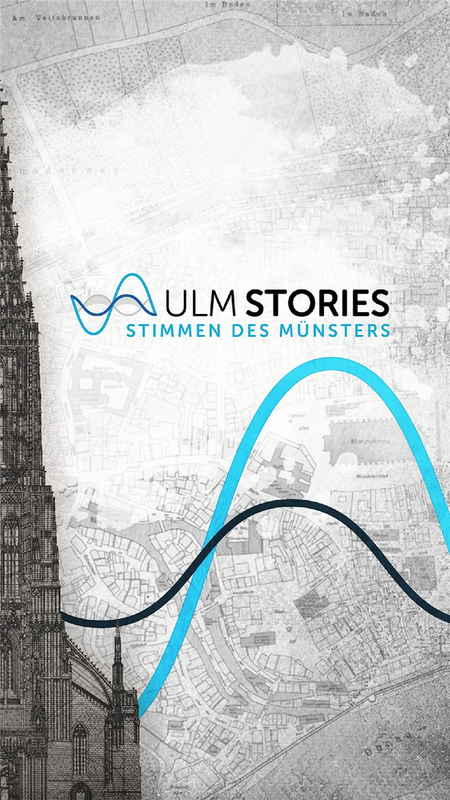 Ulm Stories. Voices from the Minster. 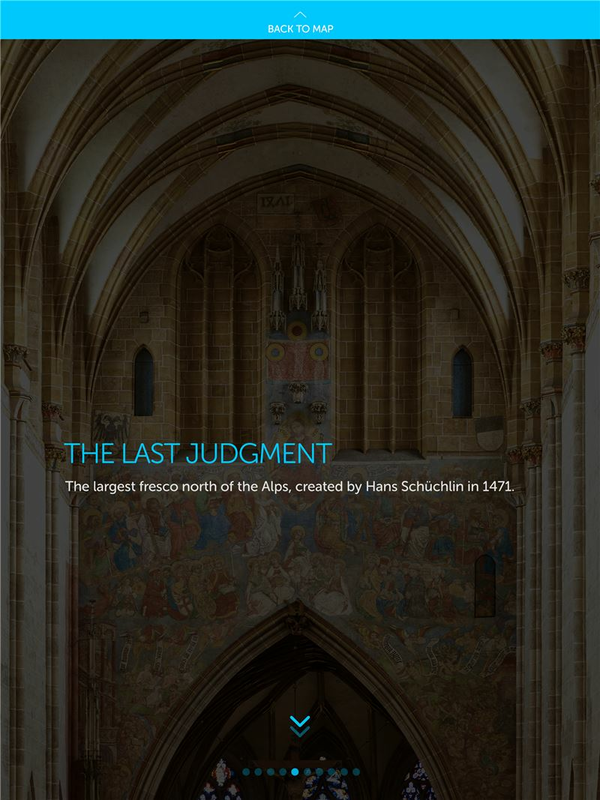 The app is the perfect companion for your visit to Ulm Minster. Through your headphones, you will hear and experience ten atmospherically dense and excitingly staged stories as you walk around the minster. As you do so, the three-dimensional spatial sound sets you right at the heart of the action. 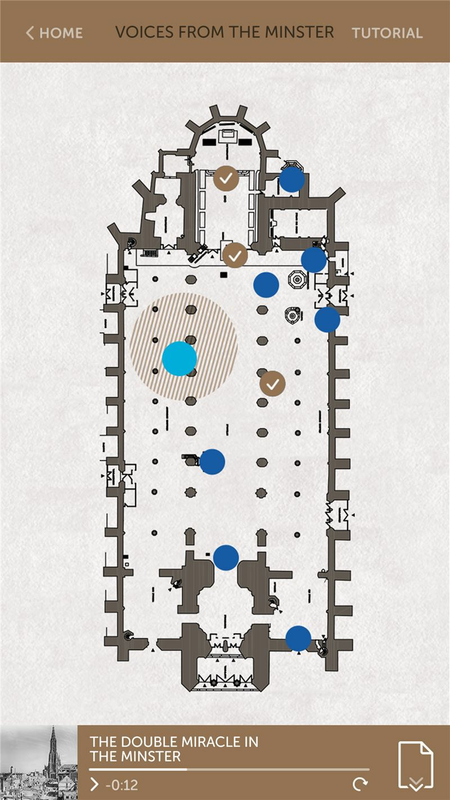 Please be aware that as you use the app in Ulm Minster, it uses your device’s location tracking function in the background.  The app can only be used when headphones are connected. 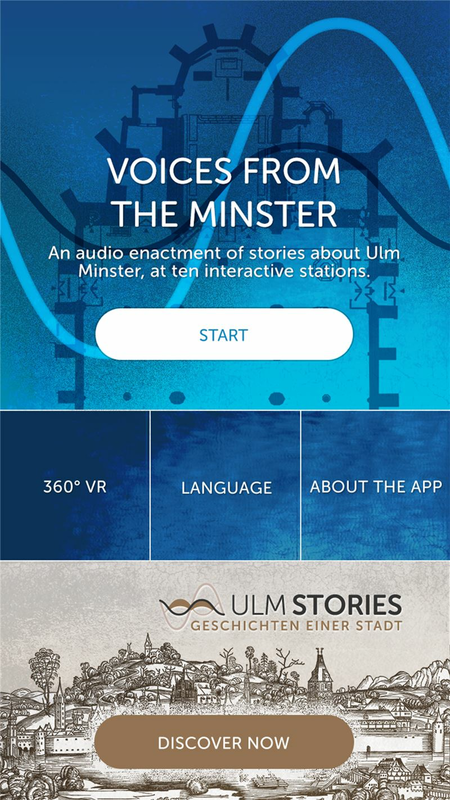 You do not need to personally visit Ulm Minster to be able to enjoy all the app’s content. You can experience all the stories in the usual three-dimensional sound and also view background information on the individual historical audio stations. The window was initiated in 1986, on the initiative of the Ulm minster building authority and the Erika Karlinger Foundation, and was designed by Hans Gottfried von Stockhausen. It is intended to serve as a reminder of the persecution of the Jewish population and their annihilation in the concentration camps. It points in the direction of the original Ulm synagogue, which was destroyed on Kristallnacht on 9 November 1938. The bottom part of the window depicts an infernal dragon. Its mouth contains naked, emaciated people with shaven heads, and it is surrounded by blazing furnaces. Beneath are the names of the concentration camps Treblinka, Auschwitz and Bergen-Belsen. In the centre, the artist has used Old Testament elements, such as the burning thorn bush, which burns but does not burn out. The pointed window arch above is decorated with shining precious stones. 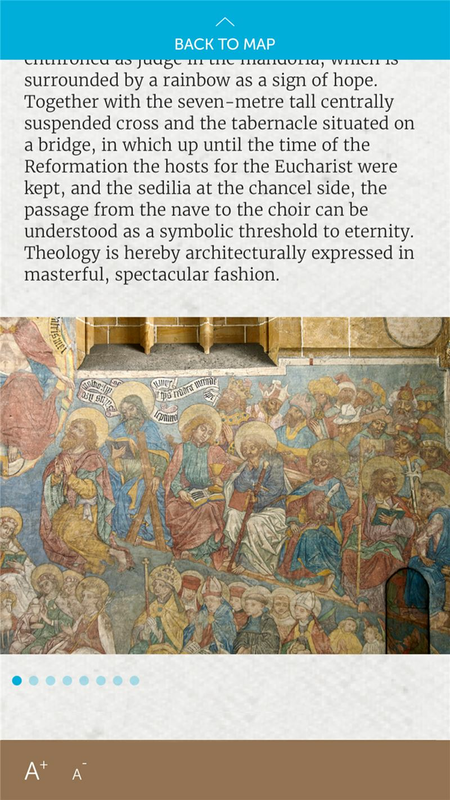 They symbolise the heavenly Jerusalem that John described in the revelation as being a heavenly place. Upon God’s will, provide relief to the paupers! = Give to the needy as required by God! In the late Middle Ages, patricians were increasingly responsible for administrating poor relief. And as well as the good deed itself, it was, then as today, also a self-representation of those carrying out the good works. The picture, which was created in 1562 by municipal painter Georg Riederer, can also be understood as a good work in this context, as it exhorts the beholder to undertake charitable works. But it also provides a reminder that one should not be afraid to ask. Above the depiction of Jesus in the doorframe to the left, the apostle Luke is quoted: Ask, and thou shalt receive. At the time it was created, the impoverishment brought about by early capitalism was gathering pace, bringing in its wake the poor to the towns and cities. Ulm adopted a progressive social law, in which the needy were differentiated into types: registered and non-registered, legitimate and non-legitimate recipients of alms. A procedure that is once again provoking discussion during the continuing so-called refugee crisis in Europe. 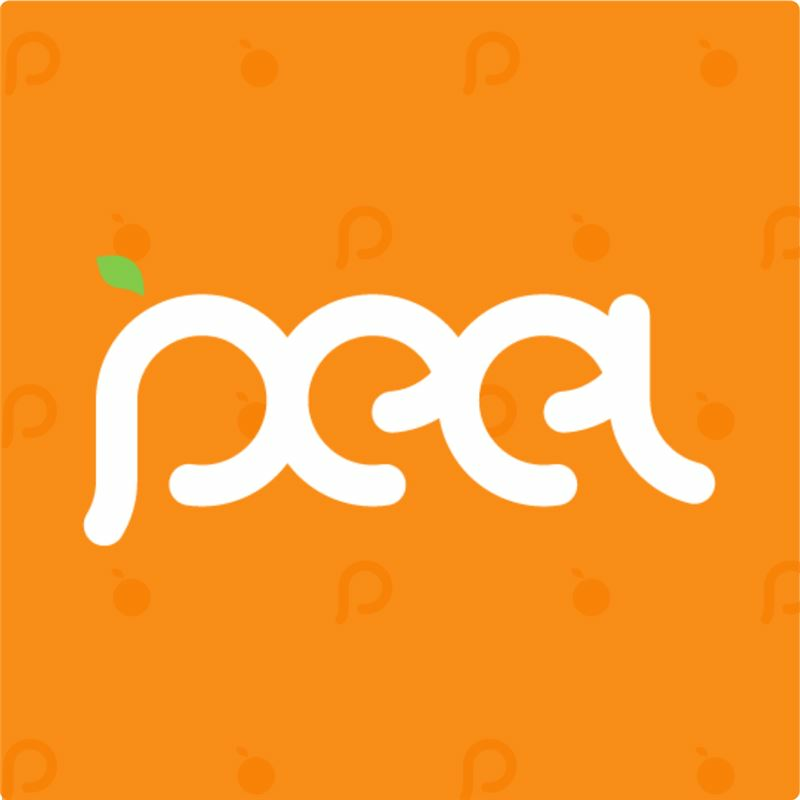 East portal, south side: Feeding the poor. Renaissance painting from 1562, painted by Ulm’s official municipal painter Georg Riederer. 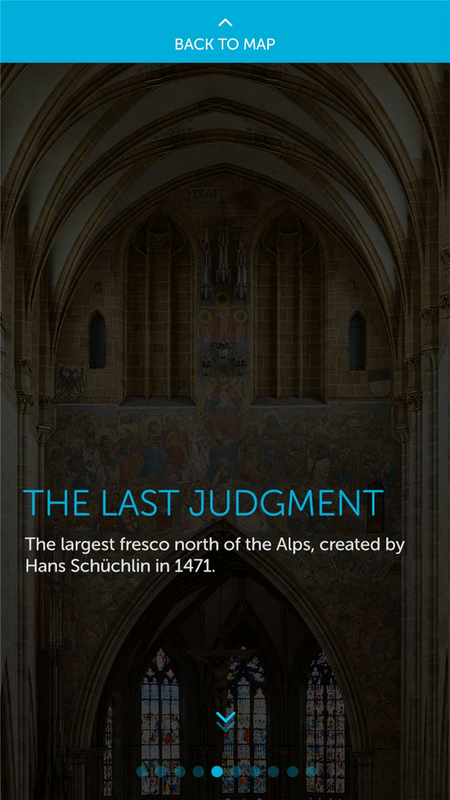 It is with this slogan that, in 1562, a picture on the alms box in Ulm minster solicited donations. The signature underlines that this ‘work’ should not be carried out for your own soul’s salvation, but for the ‘will of God’. The alms are intended for paupers; people who, although they do not beg in public, have nevertheless fallen into hardship, without actually being homeless. At this time, the impoverishment brought about by early capitalism was gathering pace, bringing in its wake the poor to the towns and cities. In order to improve the situation for the needy in Ulm, and at the same time to control and restrict aid, the city council enacted a Poor Law. All public begging here in Ulm must cease. All persons, whether from within or without Ulm, must neither receive nor seek alms from the churches, inns or other houses, neither at night nor by day. Alms must not be demanded from any house in Ulm without the knowledge and agreement of the aldermen. Persons who receive alms from honourable aldermen are obliged to wear the beggars’ sign, also known as the Holy Badge, in public. Any such person found not bearing this sign, or who visits inns, or who gambles, loses the right to receive alms. If, for fraudulent purposes, the badge is not worn, men will be brought to the cellars, and women to the lunatic asylum.